kiskeácity #LOF1804: Voices of Freedom Forum / Brooklyn Nov.18. 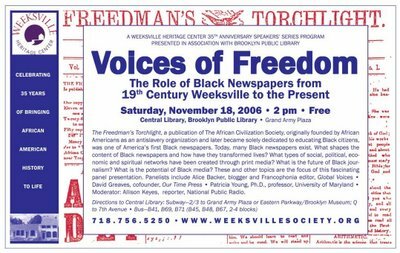 Voices of Freedom Forum / Brooklyn Nov.18. 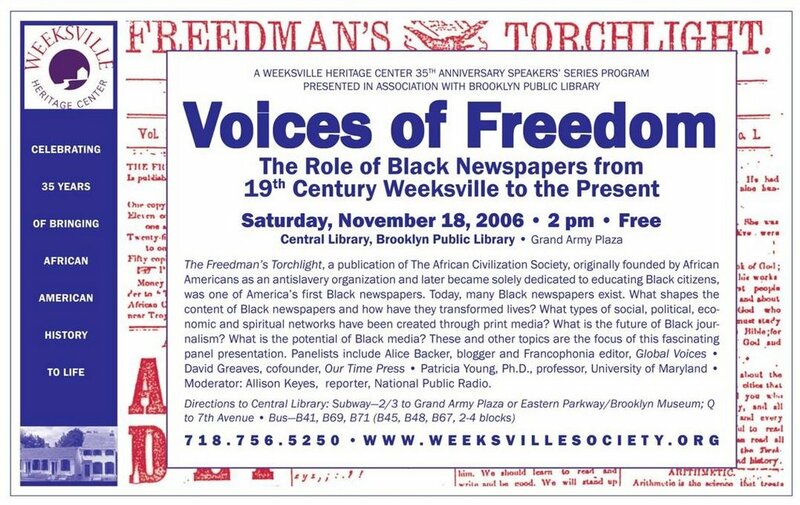 The Freedman's Torchlight, a publication of The African Civilization Society, originally founded by African Americans as an antislavery organization and later became solely dedicated to educating Black citizens, was one of America's first Black newspapers. Today, many Black newspapers exist. What shapes the content of Black newspapers and how have they transformed lives? What types of social, political, economic and spiritual networks have been created through print media? What is the future of Black journalism? What is the potential of Black media? These and other topics are the focus of this fascinating panel presentation. Panelists include Alice Backer, blogger and Francophonia editor, Global Voices • David Greaves, cofounder, Our Time Press • Patricia Young, Ph.D., professor, University of Maryland • Moderator: Allison Keyes, reporter, National Public Radio.